Ahhh, December. ‘Tis the season for a bombardment of tips on how to “beat the holiday bulge.” Things like sneaking in exercise, cutting back on alcohol, taking smaller portions. They’re all the same. Today I am going to share with you just one tip. It’s the one that has allowed me to indulge with everyone else at the table, all the while making healthy choices and saving room for dessert. When in doubt, add vegetables. The holidays for me aren’t just about office parties and cookie trays. They’re about eating meal after meal prepared by people other than myself. Rich, hearty foods to match the cold weather outside. This isn’t just something I employ over the holidays. It’s something I do every single day, allowing me to eat some of my favourite high calorie meals but without all the extra calories. Let’s take a look at the exhibits. Buffalo style meatballs. Instead of gorging on a plate full dipped in blue cheese sauce, I ate them on a pile of greens drizzled with a watered down cream cheese dressing. Falafel and lentil salad. A deceptively healthy sounding meal, but often loaded in oils due to deep frying and dressing. Throw a smaller portion on some greens and I’ve got a full belly! Regular homestyle chili can add up with the beef and beans. Usually there aren’t many vegetables in there to break it up. Hot chili tastes amazing on top of greens with a few tortilla chips. In that same vein, taco dip tastes fab on top of salads as well. Instead of filling up on caloric chips and dip, throw it on a mass of greens and your belly will feel just as satisfied. Not into throwing hot foods on cold veggies? Make sure you’ve got some greens on hand to completely overtake your plate. People won’t pester you about skimping on servings, and your eyes will still think your tummy is getting a full plate’s worth. I don’t just do warm salads, I love throwing high calorie food on roasted and steamed veggies as well! Such as adding a little spaghetti squash to regular spaghetti noodles. Or eating meatballs with a bowl of frozen veggies. This isn’t another “how to beat the holiday bulge” post. It’s a tactic I use every day. But especially when I’m eating somewhere where main dishes are prepared for me. My family is now used to my ginormous salads, or the rate at which I can blow through a bag of frozen broccoli. I often show up places with salads, chopped veggies or fruit trays. Or even carry an apple in my purse! I’ll eat the hamburger and the bun being served, but then load up with carrot sticks on the side. In some ways, learning to plump things up with veggies has kept me sane. I can still eat my mom’s famous taco dip with the family without skipping a beat in terms of healthy eating. Thankfully, my belly also loves the fibrous nature of most veggies. You actually have Kristin to thank this week’s Food For Thought topic. We were discussing sardines today whilst eating the world’s best pancakes. Alas, the pancakes will have to wait for another day. I’m doing this for your own good. First, let’s go over why they’re so awesome. Sardines are one of the best foods out there for Omega 3 fatty acids (behind flax, walnuts and salmon). It’s an essential fatty acid, meaning our body requires it but can only get it through nutrition. Helps sweep cholesterol out of the bloodstream. Heart disease is the number one cause of death in North America, so nothing to be taken lightly. Sardines also have as much calcium as yogurt along with a hefty dose of Vitamin D to naturally help absorption. 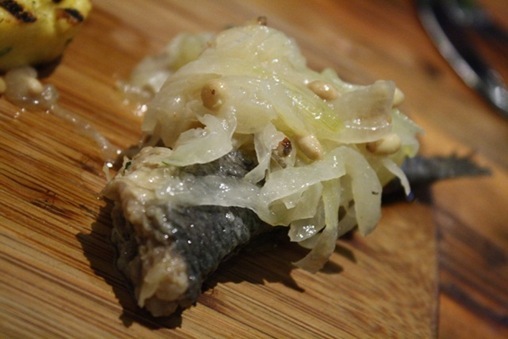 Sardines are also a fantastic source of Vitamin B12. The most important function of B12 is its role in the formation of red blood cells. It’s found mostly in meats and many vegetarians are deficient in it. Not good. Now, let’s talk about how you can eat it! 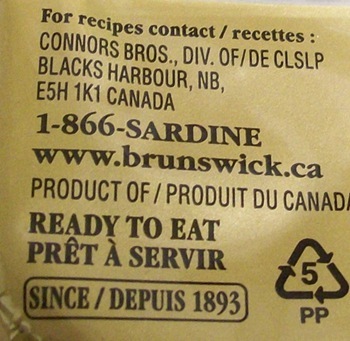 I am partial to Brunswick Sardines because they come in fun flavours, but also my home province! You should be able to find these in many grocery stores around the world – they have a fairly wide distribution. One whole can is only 140 calories, 7g fat, 16g protein. This particular one is high in sodium because of the flavouring. Keep an eye out for water-packed cans, they should be lower in sodium. 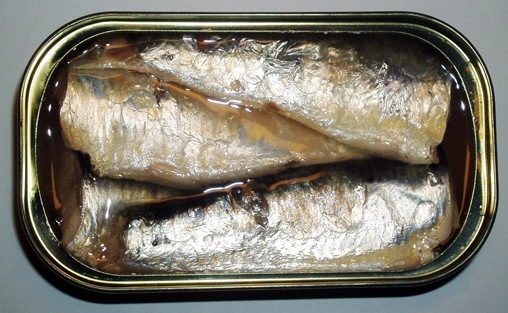 It’s also important to know most brands of sardines don’t come with the heads. Just wanted to make that clear, as some people think they do! If that were the case, then I would agree that they’re gross. I usually mash the fish up right away in the can. You honestly can’t detect any hint of scales or bones when you mash it up. And it’s important to keep those bones in to get the calcium! 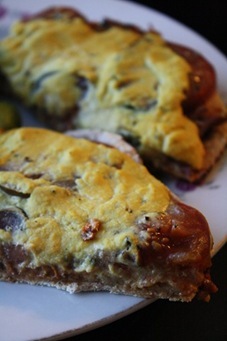 My favourite way to eat the tomato sardines is as a base for pita pizzas. Melt cheese on anything, and it immediately becomes delicious. 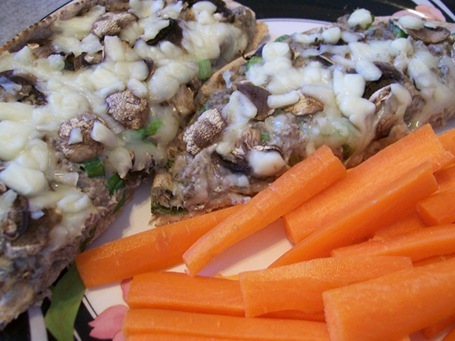 Like the above plain sardine melt with oregano, chives, mushrooms and mozzarella. Brunswick also carries a mustard flavour. 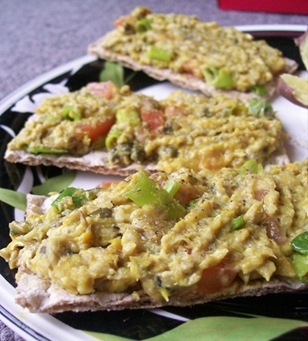 It makes for a great spread on crackers with some capers and green onion. My favourite way to eat sardines? 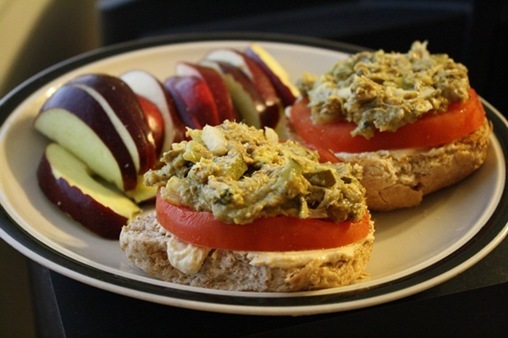 Mashed with cream cheese and used as a spread on a sandwich with turkey. 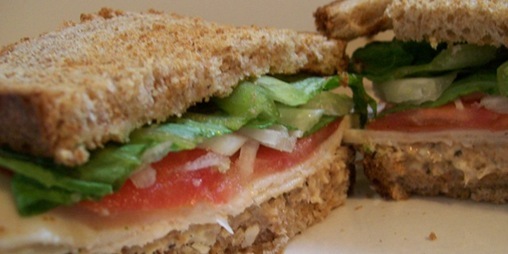 It adds an amazing dimension of rich flavour to an otherwise boring poultry sandwich. Sardines are also low in mercury, so they make for a great tuna replacement. 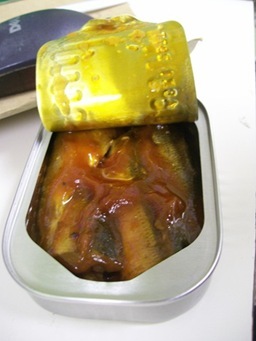 Canned sardines are of course the most available, but they’re great fresh too! Like topped in pickled onions and pine nuts. Much milder than the canned variety. 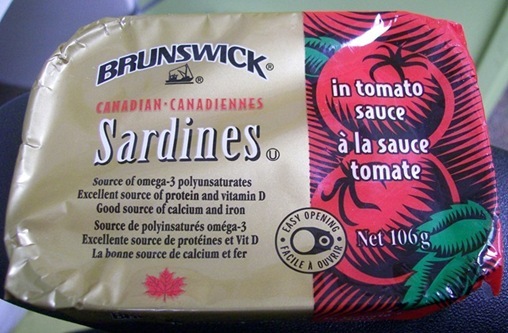 Question of the Day: Do you eat sardines? What’s your favourite way to have them? Hellohello! Hope everyone had a wonderful weekend. Even better if it was a long weekend for you! 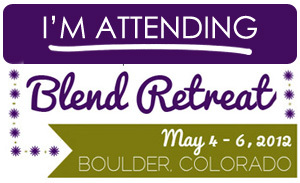 I am coming off a weekend of working Thu-Sun straight. Well, technically a week of Mon-Sun. But that is neither here nor there. I’m here to talk about food! As a personal trainer, I get a lot of questions about protein powders. Should people be using them, what kinds to get, how to eat them. I always respond by telling people that I’m a bit of a hippie in the sense that I think nutrients should come from unprocessed natural foods. Not in powder form! Of course, I’m also realistic and realize the diet of the average person could use a little boost. Especially the average active person! Long-time readers of my blog will know I’m a regular user of protein powder. I just try to use it wisely and sparingly. First and foremost protein powder will not make you gain weight. That is, if you swap it out with other foods in your diet. For example, you can’t eat your regular daily foods and add a 300 calorie protein shake on top of that. Then you will gain weight. Rather, swap out one of your meals or snacks with the shake and you’re replacing rather than adding calories. So why would someone want to use protein powder? A number of reasons. 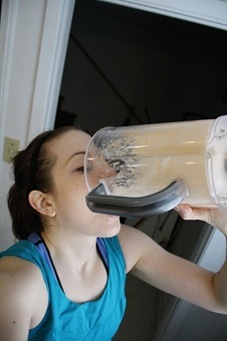 Some people like to drink a protein shake after weight lifting or intense activity to help in muscle repair. This just means the muscle tissues damaged during the workout build back up better, which helps you get that lean look you’re after. Some say it helps with soreness as well. Although, I personally have never noticed a difference. Protein powder is also a way to get protein without additional fat or carbohydrates. It’s pretty easy to find a food that’s straight up carbohydrate (sugar) or fat (oil). But natural proteins usually come with additional macronutrients. Some are better than others, like egg whites or white fish, but protein powder is a way to get your protein straight-up! Whey protein is the most common kind. It’s a protein found in milk. It’s known as being quick digesting and best for right after a workout when you want protein asap. Casein also comes from milk, but is a little slower digesting. People who use casein usually have it before bed to help muscle repair overnight (when breakdown of the muscles can occasionally occur). Casein is also a popular dairy allergen, so careful with this one if you have sensitivities! The protein found in soy beans. This is a much finer powder and great for baking with. You can sub out some of the flour in a recipe with soy protein without too much of a texture difference. A lot of people are now careful of their soy consumption these days because of its estrogen content (which can mean breast cancer for women). I say take it in moderation just like anything else. Hemp is actually a whole protein, containing all the essential amino acids. One of the few vegan sources that does besides soy. Hemp is typically a very fine powder and has an “earthy” taste. Some people dig it, I think it takes some getting used to. I have honestly never tried brown rice protein. Mostly because the carb-protein ratio is close to equal on this stuff and I prefer a powder that’s mostly protein. Another powder I haven’t tried. Mostly because egg whites have a great percentage of protein to begin with, so I have no need for it isolated in powder form! Speaking of isolation, that’s a word you will hear a lot. Protein isolate means that the protein has been isolated from the source so the powder is essentially pure protein. Protein concentrate means it’s still mixed with a little carb, fat and other ingredients. Sweetener. I try to use unflavoured powders or ones sweetened with stevia. Artificial sweeteners include sucralose or acesulfame potassium. I usually stay away from them because too much gives me digestive issues. Serving size. Some powders list one scoop as 20g, others list one as 45g. Before you get excited about how many grams of protein there are, make sure you double check the calories and serving size that are listed as well. Weird ingredients. The isolate/concentrate protein should be at the top, followed be a sweetener, perhaps a gum thickening agent, and a flavouring. Anything else is unnecessary. The last question I get asked all the time is how do I use it? Question of the Day: Do you use protein powder? What kind?